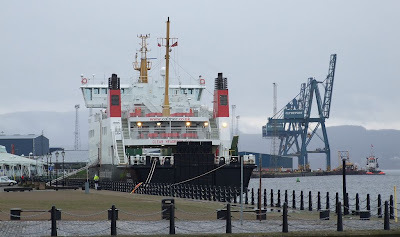 To make room in the James Watt Dock for the three ships leaving the Garvle Drydock this morning, CalMac's CORUISK, which had recently been in temporary lay-up in King George V Dock, had to move elsewhere. 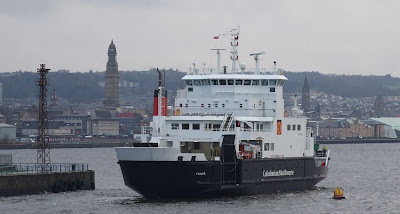 She was due to replace ARGYLE on the Rothesay service, but as that run is currently affected by industrial action by the Argyll and Bute Council staff who man Rothesay pier, no service is operating. ARGYLE had been laid up at Gourock, where CORUISK has now taken her place. This move necessitated finding another berth for ARGYLE, due to move into the Garvel yard on Thursday. While she is waiting her slot in the drydock, she is berthed at Customhouse Quay, Greenock.